This article is about the bridge in Parramatta, Sydney, in New South Wales, Australia. For the bridge in Glenbrook in the lower Blue Mountains, New South Wales, see Lennox Bridge, Glenbrook. The Lennox Bridge in Parramatta, from the west. The Lennox Bridge is a heritage-listed sandstone single arch bridge across the Parramatta River, located in Parramatta in Western Sydney, New South Wales, Australia. The bridge was designed by and built under the supervision of David Lennox, the first Colonial Superintendent of Bridges using convict labour between 1836 and 1839. The Lennox Bridge is the third oldest surviving masonry bridge in New South Wales. The bridge carries Church Street, the main north-south street of Parramatta's central business district. It was added to the New South Wales State Heritage Register on 2 April 1999. A view of the Lennox Bridge from the northeastern bank of Parramatta River. The Lennox Bridge is on the site of the earliest documented crossing of the Parramatta River in the Parramatta area, dating from early colonial settlement. The current bridge is the third on, or adjacent to the site. The first was a simple timber footbridge which was destroyed by floods in 1795. The second bridge, called the Gaol Bridge; built on stone piers with timber railings and was completed between 1802 and 1804. The current Lennox Bridge is a single span stone elliptical arch bridge over Parramatta River on the line of Church Street. The Lennox Bridge is constructed of sandstone sourced from the Parramatta Female Factory quarry. Completed in 1839, the bridge cost £1,797 to complete. This was David Lennox's third and final bridge, his first two being the Lennox Bridge at Glenbrook, completed in 1833 making it the second-oldest bridge on the Australian mainland, (the oldest being the bridge at the base of Devines Hill at Wisemans Ferry on the Great North Road, which was completed in 1829-30) and the Lansdowne Bridge, Lansvale, completed in 1836. In 1885-86 the Department of Public Works removed the wall on the upstream side of the bridge was to widen it, and put up the present railing at the same time. In 1901-1902 the bridge was strengthened internally for the Castle Hill Tramway. In 1912 the parapet on the western side was removed, providing a cantilevered pedestrian way. In 1934-5 this new section was removed; the Department of Main Roads widening the bridge in order to handle increased traffic. This modification saw the replacement of the cantilevered walk-way with an open concrete type and the straightening of the curved western face. In the 1990s Lennox Bridge was saved from demolition by campaigning by the National Trust of Australia (NSW). Lennox Bridge is a single sandstone arch bridge spanning 91 feet (27.73m), the clear span of the arch being 23.16 m across the Parramatta River with approaches on the line of Church St. In 2012 a controversial proposal to construct tunnels through the bridge on both sides of the bank for pedestrians and cyclists was approved by Parramatta City Council; and work began in early 2014 with expectations to open before Christmas that year. However, there was a delay attributed to archeological investigations that uncovered a sandstone pier and timber girders of the second bridge on that site, built between 1802 and 1804. The northern tunnel has opened, but the southern tunnel has not. Lennox Bridge is one of Parramatta's most important historic structures, and one of the earliest bridges in New South Wales and Australia. It is an example of the work of notable engineer David Lennox. The site possesses potential to contribute to an understanding of early urban development in Parramatta. The bridge is both historically and technically significant, and is rare. Lennox Bridge, Parramatta was listed on the New South Wales State Heritage Register on 2 April 1999. ^ a b c d "Lennox Bridge". New South Wales State Heritage Register. Office of Environment and Heritage. Retrieved 12 January 2015. ^ a b c d e "Lennox Bridge, Parramatta". Heritage and Conservation Register, Roads & Maritime Services. Government of New South Wales. 14 May 2009. Retrieved 12 January 2015. ^ a b Barker, Geoff (2 January 2014). "Lennox Bridge, Parramatta, 1836-1839". Parramatta Heritage Centre. Parramatta City Council. Retrieved 12 January 2015. ^ a b c Kembrey, Melanie (7 December 2014). "One of Australia's first bridges found within Parramatta's historic Lennox Bridge". The Sydney Morning Herald. Retrieved 12 January 2015. ^ a b c d e "Lennox Bridge". New South Wales State Heritage Register. Office of Environment and Heritage. H00750. Retrieved 2 June 2018. ^ Newell, H. H. (2 October 1935). Lennon Bridge (Plaque, erected at the time of the widening of the bridge). Sydney: Commissioner for Main Roads. ^ "Lennox, David (1788–1873)". Australian Dictionary of Biography. Canberra: Australian National University. Retrieved 10 October 2017. ^ "Parramatta Heritage Ride". Cyclists Action Movement West. ^ "Parramatta's historic properties under threat from development". Daily Telegraph. 17 October 2012. Retrieved 12 January 2015. ^ Bartok, Di (20 February 2013). "Bridge pioneer shame". Parramatta Advertiser. Retrieved 12 January 2015. ^ Bartok, Di (25 October 2012). "Don't drill Lennox bridge: Parramatta heritage fighters". Parramatta Advertiser. Retrieved 12 January 2015. ^ "Work begins on Lennox Bridge portals". Parramatta Advertiser. 3 February 2014. Retrieved 12 January 2015. ^ Kembrey, Melanie (5 February 2014). "Historians lament 'loss of heritage' as tunnel work starts". Parramatta Sun. Retrieved 12 January 2015. ^ "Tunnel through the north end of Lennox Bridge will be open to pedestrians and cyclists before Christmas". Parramatta Advertiser. 19 December 2014. Retrieved 12 January 2015. ^ Bartok, Di (2 October 2013). "Lennox Bridge work could be held up by Heritage Office". Parramatta Advertiser. Retrieved 12 January 2015. 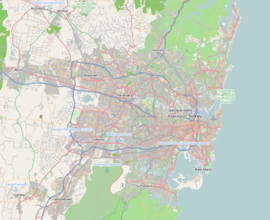 This Wikipedia article contains material from Lennox Bridge, entry number 00750 in the New South Wales State Heritage Register published by the State of New South Wales and Office of Environment and Heritage 2018 under CC-BY 4.0 licence, accessed on 2 June 2018. Wikimedia Commons has media related to Lennox Bridge, Parramatta. Kass, Terry (February 2006). "RTA Thematic History: A component of the RTA Heritage and Conservation Register" (PDF). NSW Roads & Maritime Services (PDF) (2nd ed.). Government of New South Wales. Retrieved 12 January 2015.